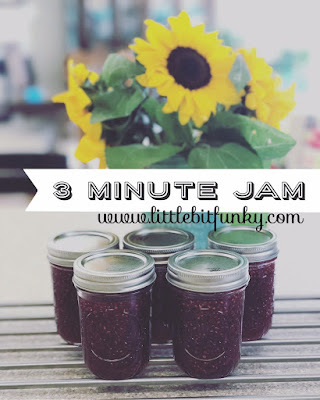 I've been a little jam obsessed recently. Spending hours picking berries and then coming home and turning them into something beautiful has been very therapeutic for me. And this super simple method makes it all the more easy to justify. Sure, it doesn't take an actual three minutes but that name helps to remember the steps. Want to make some? You only need berries, sugar, jars and lids. Start by adding your canning jars and lids to a large stock pot. Allow them to simmer the whole time you are preparing the berries. Remove them from the pot with tongs only when you are about to fill them with jam. Put your berries in a large stock pot and add enough water to cover the bottom. Simmer until they are warmed all the way through. Allow to simmer for a few minutes. Using a Foley Food Mill or a food masher of some sort and a strainer, process the berries to remove unpleasant seeds, stems, etc. A food mill is invaluable for lots of things. I especially love to use it to make applesauce in the fall as well. Bring the mash to a simmer, stirring constantly and allow to simmer for three minutes. Add your sugar to the mash, bring back to a simmer and simmer again for three minutes. Stir the whole time all of this is happening. After that, remove from the heat and whisk for three more minutes. This helps release the natural pectin in the fruit. So far this method has worked on blue, rasp and black berries. Remove your jars from the simmering water, fill and lid them. Use a towel to hold the HOT jars and liquid. As the jars cool they will seal! I love to hear that pinging sound in the kitchen! The jam will also thicken up as it cools. No pectin needed! The result is a delicious fresh jam that tastes just like summer! Make some now for Christmas gifts or for your own family to enjoy all year round!